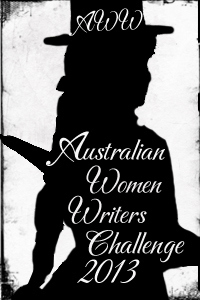 Canberra poet Lesley Lebkowicz has made a couple of brief appearances in my blog: first in my post on The invisible thread anthology, and then when she won this year’s ACT Poetry Award. I was consequently more than happy to accept for review her latest book, The Petrov poems. It’s intriguing that nearly 60 years after the events, we are still interested in the Petrovs. In fact, I have written about them before, in my review of Andrew Croome’s historical novel, Document Z. 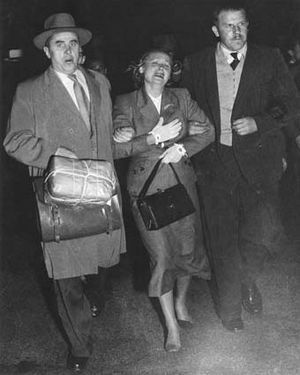 Most Australians will know who they are, but for those global readers here who don’t, the Petrovs were a Russian couple who worked at the Soviet Embassy in Canberra in the early 1950s. Vladimir (Volodya), Third Secretary, and his wife Evdokia (Dusya) were both Soviet intelligence officers (or, to put it baldly, spies). They defected in 1954. The defection was particularly interesting because Vladimir defected first, and Evdokia two weeks later at the airport in Darwin after some dramatic scenes at Sydney’s Mascot airport. At first glance, The Petrov poems looks like a collection of poems but in fact it is a verse novel, albeit one comprising many short individually-titled poems. These poems are organised into four “chapters”: Part 1, Volodya defects; Part 2, Dusya defects; Part 3, The Petrovs at Palm Beach; and Part 4, The Petrovs in Melbourne. I must admit that I wondered, initially, why Lebkowicz had decided to write about the Petrovs, given that they have already been picked over in novels, non-fiction, theatre, and television. But, as soon as I started reading it, I could see why. Lebkowicz gets into the heart of these two characters, bringing them back to ordinary human beings who were caught up in something that was both of and not of their own making. It is a rather pathetic story. There are no heroes here – and yet, as happens with these sorts of things, it captured the world’s attention for a short time. One of the ways I recognise the poetic is when I find works in which language is condensed, ramifying, polysemous and unparaphraseable. Part of what I wish to do when writing poems is to make works that speak in such ways – but to do so without resorting to any kind of trickery or artificial obscurity. Once again he’s going to be wrenched from the soil. by foolish men, and dying in the freezing night. for sadness and home and ruffles his Alsatian’s fur. While she understands Volodya’s fear, she fears even more what might happen to her family if she defects. At Darwin airport she doesn’t want to make a decision: “If only/this government man would abduct her”. But of course he can’t. We then watch them as their relationship falters, first during ASIO’s interrogation, and then the years of living together in Melbourne, officially in disguise but known nonetheless. (“The whole street knows they are Petrovs -/too many photos, too much publicity”). These are wonderful, readable poems. They are poetic but, to quote Paul Hetherington’s goal, without “trickery” and “artificial obscurity”. The imagery is strong but clear. I particularly liked the way Lebkowicz varies and plays with form. None of it is rhymed, but there are sonnets, couplets, poems with multi-line stanzas but closing on a single dramatic line, and others. There are poems with short lines or terse rhythms, indicating action or stress, and poems with long lines conveying thoughts and reflections. There is also a shape-poem, “Torment”, in which the zigzag shape mirrors Dusya’s distress (“Her life is a staircase that switches directions”). Like any good historical fiction – if a verse novel can be called that – you don’t need to know the history to understand the story told here. And like any good historical fiction writer, Lebkowicz has produced something that enables us to reconsider an historical event from another perspective and to understand the humanity below the surface of the facts. An excellent and moving read. The one from “Glass” really struck into me. Glass struck into you, eh? That sounds painful! Seriously, I’m glad you like it, Hannah. This sounds very moving. The collision between the personal and the political. I don’t know this story but it makes me think of E.L. Doctorow’s great novel The Book of Daniel about the persecution of the Rosenbergs, which also used striking language – sometimes I just had to sit there or be blown away! You know Catherine, I haven’t read any Doctorow. Must remedy that. The Petrovs were I think much smaller fish than the Rosenbergs, which is probably why they survived. Otherwise you’d think the KGB would have done something … But who really knows the ways of spies!? Oh this sounds good. And a shape poem in there too! I like shape poems but hardly anyone writes them anymore. Yes, Stefanie … And there’s just one which gives it dramatic effect at her time of greatest mental disarray … I love the way she varied form … It made it such an interesting verse novel. Perhaps almost the poetry equivalent of connected short stories except the narrative did flow pretty directly from poem to poem. I’m so glad that you reviewed this – it has reminded me that I must get myself a copy. I was lucky enough to hear Lebkowicz read from and talk about the Petrov Poems at a conference earlier this year. I recall her saying that she initially wanted to focus on Evdokia but found Vladimir too compelling a character to put aside. It is lovely writing and I’m looking forward to reading it in full. Oh that would have been great Dani. You can tell she’s more “into” Evdokia but I think she does get Vladimir as well. Such a sad story though I think Evdokia may have been happy enough at the end. It’s a gorgeous read. A shame that verse novels are not more common – they might shaken everyone up a bit. I had not heard of this case – they seem to have been particularly vulnerable people caught up in the cold war crossfire. I agree Ian … I’ve reviewed a small number on this blog now and each one I’ve enjoyed a lot. This was quite different in form but wonderful. I think it was one of those complicated things – they were and weren’t vulnerable – but in the end I think you could argue they were more vulnerable than not, and the change in the regime post-Stalin made them moreso. Lesley Lebkowicz’s Petrov Poems | Me fail? I fly!